We’d love your help. 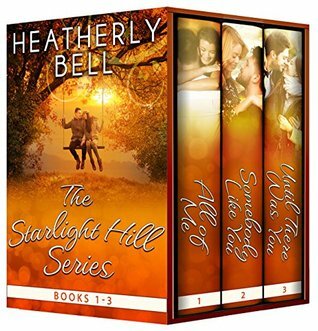 Let us know what’s wrong with this preview of The Starlight Hill Series by Heatherly Bell. Voted what to Read After Gilmore Girls! What would you do for a second chance with your first love? Welcome to wine country and the small town of Starlight Hill, California, where the wine flows freely and so does the gossip. The town has never quite forgiven Ivey Lancaster for leaving their favorite son, Dr. Voted what to Read After Gilmore Girls! The town has never quite forgiven Ivey Lancaster for leaving their favorite son, Dr. Jeff Garner, when she met a man on an online dating site. But while the people of the township took sides, the truth of her absence is something Ivey doesn’t want anyone to know. When a sudden change of plans forces Ivey to work with her hunky ex, she must keep it professional or risk her heart all over again. Strike One ... in one night, Brooke Miller loses her boyfriend, her job and possibly her reputation. She vows revenge on her old boss by bringing a defunct vineyard back to its former glory. But ex-baseball star Billy Turlock swoops in and buys her dream vineyard. Strike Two…Billy hopes the new family business will give him direction and purpose, now that he can no longer play baseball. He can’t afford to fail again, and for that he needs Brooke, who has hated him and all athletes since high school … even if he’s never forgotten her. How far would you go to get your fantasy man? Would you marry someone who looked just like him? Genevieve Hannigan has loved her big brother’s best friend, Wallace Turlock, for as long as she can remember. But when he never noticed her, she settled for Wallace 2.0. With her disastrous two month marriage behind her, Gen knows that nothing but the original Wallace will do. To ask other readers questions about The Starlight Hill Series, please sign up. Though each story is a stand alone, they interconnect with repeating characters. The town of Starlight has seven books in the series. But the first three are here.in the first story was about A woman and man who broke up when he to school to be A doctor. She came back as A midwife. The town takes sides on the dueling couple. What happens when her past comes to light and he is deviated? The second story is about a retired, due to injuries, baseball player buys a vineyard. And hired an old friend. Who happens to be the one he left behind. The third is about his brother who is trying to finish a job for a very picky client. Who happens to be his best friend sister. And keep her away from her ex. But she has a secret that is too funny to say here without giving away the plot. This book came in a 3-pack of Ms Bell's books, so all I spent was my time. I slugged my way through the first book (yes, it felt like a fight, & I don't know why I did it), but didn't bother with the other two. The characters are sketchy, the plot boring, and everything is entirely predictable -- yes, I know romance stories, by their very natures, are somewhat metric, but not to the point of knowing what the next sentence will be. Actually, I think the one star is a gift! I got the 3-book pack that includes the first 3 books of this series. I enjoyed the first two. They are cute romances, with an interesting sub-plot (midwives in hospitals, starting a winery), there is some will they/won't they drama and side characters I enjoy seeing. The third book doesn't have an interesting side plot and the will they/won't they is over the top. I am somewhat curious about characters in the follow ups... But I have about 700 other books to read first. I enjoyed this series set in Napa, one of my dream destinations. The romance of the storties was good. The only drawback for me was the incorrect usage of cliches. I almost stopped reading this book because of that. Overall, a light read that left me with warm, fuzzy feelings. Love the way Heather brings her books and characters to life. I also like the idea of becoming friends with the characters I am reading about. Loving this series. Characters are relatable with everyday real life problems and obstructions to happily ever after. Ok for a free series. I do wonder if the author proof read this series or whether she left it to others. Spelling errors, repetarive and confusing the characters names and using the wrong ones. I can see why these were free. I liked the characters though. Enjoy the vineyards and the small town vibe woven throughout the three books. The families and friends make the stories believable and interesting. Loved each couple and their journey to each other. Love these characters! Small town but lots of incredible people, would love to find a real place like this. All characters have some flaws but nothing you can't get past. Need to get book 4 soon. All three of this books were awesome. The stories were great & well written.It would be hard to pick better than the other.I would recommend these to anyone.I will reading more of this author's books. Poorly written, goes on and on, repeating the story lines. I couldn't finish any of the three books, just skimmed to the end. Great love stories. Enjoyed the real life issues that came up and I’m ready to move to Starlight Hill and be part of a great town. Liked the stories, relatable characters, funny. BUT too too many grammar mistakes. Frustrating in that way. It took away from enjoying the books. Did not finish. The style of writing and story line are not for me. Each of these love stories is worth reading on it's own. Having them all together makes the reading even better. Nice romance set with each having a HEA. This is a three book series, with probably more to come. It was a good read, though predictable, but not a page turner. The storyline caught my attention but I pretty much skimmed the entire first story. I'm not sure if I'll continue and read the last two books in this series. Enjoyed reading about the family, love how all the characters interconnect. Can't wait to find out what happens to Scott. It kept me reverted from start to finish. The characters were more real than any I read about. There are more stories in the town to tell. A plot runs through it. Just how I like my summer reading, light, fun, and happily ever after with some personal growth and angst thrown in. This is a deliciously fun box set that I thoroughly enjoyed. You get not 1 book, but 3 romance books. They're all three awesome, and not a clunker in the bunch. It truly is a 5 star set, and every book in the set is 5 stars. There's a wonderful cast of characters in each book that makes each one special. This has been the best series. In book one there is Dr. Jeff and midwife couple who had been together since high school and when she finds herself pregnant makes up an internet boyfriend and leaves. Five years latter she returns home to take care of her aunt and Jeff is there and finds out about the baby. Then in book two we have another second chance for lost love Billy is a washed up base ballplayer so he buys the vineyard that Brook wanted then hires her to run it and old flames are rekindled.